Billy McCullough (born 27 July 1935 – full name William James McCullough) was born in Carrickfergus in Northern Ireland. He played initially for Portadown a club in the Province with a long history and tradition. The club was formed in 1887, and for much of its history, it was a regular run of the mill club – which is what it was when Billy McCullough played there. In fact their rise to stardom didn’t happen until the late 1980s when the club won the Irish League, the Ulster Cup, and the Budweiser Cup. Billy missed all this – and also the club’s first run in Europe with an appearance in 1962 in the Cup Winners Cup. But back to Billy himself – in 1958 he moved from N Ireland to London and was signed by Arsenal playing his first game on Boxing Day that year against Luton Town. I believe he was signed in the summer of 1958, and thus would be one of George Swindin’s first signings, he having taken over Jack Crayston in June. When he arrived Dennis Evans was the regular number three – although for a handful of games at the end of the 1958/9 season Evans moved to right back so McCullough could play left back. It is suggested in some reports this was a long term move – but it wasn’t – it just occurred in five games in the first season. In 1959/60 McCullough replaced Evans for a major part of the season, I believe because of injury to Evans, with Billy making 33 league appearances. Then in 1960/1 he made the left back position his own when he only missed a single league match. Swindin had moved Len Wills to right back in this season but in 1961/2 Arsenal played mostly with Magill at right back and McCullough at left back. Billy McCullough therefore had the great misfortune to play under two managers who managed to achieve precious little beyond keeping Arsenal in the first division. The league position and cup record were awful, and Arsenal were always seen as a good chance for a Cup shock. But at least during this time Billy was able to notch up some caps for Northern Ireland. His first was achieved in April 1961 and he played ten times for the province, ending in 1966. He was replaced at Arsenal by Peter Storey, and when Bertie Mee took over in 1966 he made McCullough (then31) available for transfer. He made his final appearance for Arsenal on 19 March 1966 against Manchester United, away, wherein he was substituted and replaced by Peter Simpson. Arsenal lost 2-1. Billy then moved to Millwall in August 1966, and later played for Bedford Town, Cork Celtic and Derry City. Billy must now be 78 years old, but I am sorry to say I don’t know what he did after playing for Derry City. If you know, please do tell. I remember Billy well…..especially the nickname he had of ‘Flint’ after the Robert Horton character of Flint McCullough in the 60’s TV series Wagon Train. I believe he became a club manager in Ireland and later moved back to Woodford in Essex to work for his father-in-law as an electrical engineer and is now retired, living in Potters Bar in Herts as far as I know. I don’t know how much of this you’ve seen already, and it could be false anyway. The Wikipedia Talk page about Cork Celtic has a note from a Carl Davenport, saying that he wrote a book. He was there 1967-9 and 1974. According to http://www.the-highbury-inn.co.uk/viewtopic.php?f=97&t=764, Billy McCullough was at Cork Celtic in 1968-9, so that book might have information. That Highbury Inn page also mentions some time at Detroit Cougars (NASL), which is also mentioned on Glentoran.com. Perhaps he was in the team, but it may be that he never played for them? Highbury Inn also mentions that he was an electrical engineer in Essex, so there could be records there. 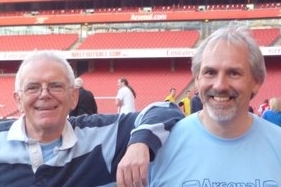 Goonerholic has a page on him, which seems to think he is still living in north London http://goonerholic.com/2008/01/thank-you-billy-mccullough/ (2008 article). I can confirm that McCullough’s last appearance for Northern Ireland was shortly after England’s World Cup win, a 2-0 England win at Windsor Park, in a qualifying match for Euro 68. In 1967, the United Soccer Association and the National Professional Soccer League were both founded in the U.S., trying to build on the interest generated by the World Cup. The next year, these two groups did what they should have done from the start, and combine their efforts in a single league, the North American Soccer League. The USA took foreign teams and rebranded them as North American teams, and, as Gord said, Glentoran became the Detroit Cougars. According to an NASL tribute website, McCullough played for them, wearing Number 11 (certainly not a defender’s number, as Andre Santos has proven), but no statistics are available, not even games played. Wolverhampton Wanderers became the Los Angeles Wolves, Sunderland the Vancouver Royal Canadians, Stoke City (then featuring Gordon Banks and George Eastham) the Cleveland Stokers, Aberdeen the Washington Whips, Hibernian became Toronto City, Dundee United the Dallas Tornado, Shamrock Rovers went to North America’s most Irish city and became the Boston Rovers, the club now known as ADO Den Haag became the San Francisco Golden Gales, Cagliari (featuring Gigi Riva) the Chicago Mustangs, Brazil’s, Bangu the Houston Stars, and Uruguay’s, Cerro became the New York Skyliners, playing in front of 60,000 empty seats at the old Yankee Stadium. The NASL, which peaked in the latter half of the 1970s thanks to Pele and Franz Beckenbauer of the New York Cosmos, featured several Arsenal players of note, mostly after they were washed up: Charlie George played for the Minnesota Kicks, George Graham for the California Surf (but not at the same time as his former Chelsea teammate Charlie Cooke), Bob McNab for the San Antonio Thunder (where he was a teammate of Bobby Moore in 1976) and the Vancouver Whitecaps, and Peter Simpson and Alan Ball for the New England Tea Men of the Boston area. Wow, you sure filled in a lot on that Glentoran/Detroit point! Thanks. One point of trivia I didn’t put in, it seems that fairly close to modern times, Chelsea picked up a masseuse by the name of Billy McCullough. Oops, I expect it is a different Billy McCullough. I looked a bit more, I did find overall standing for that 1967 season, as well as all the games played by Vancouver. Wolverhampton one the league (as Los Angeles). The competition was won by Woverhampton Wanderers representing Los Angeles. Billy McCullough played no games. I recall that for a while we had a couple of Northern Irish fullbacks playing together Eddie Magill (RB) and Billy McCullough (LB). The other thing I remember about Billy McCullough is that he married a girl from the street where I was living and who I went to junior school with. But it was no great thing to marry a footballer in those days. I was married to a distant relation of his ,nd his Niece, a Hillary Mcullough also from Carrickfergus said that in the mid 90s, he was working as a taxi driver in London. She used to recall that G Best used to visit Billys mums house in Carrickfergus, on return trips from England to play and train for N Ireland. He still has a lot of family in Carrickfergus. He is my Great Uncle I came across this site while tracing my family tree. I have some clippings from newspapers etc of him :). Lisa if you would like to share those clippings and can scan them I’d love to see them. I am about to go abroad for a few weeks so could you send to TonyAttwoodofLondon@gmail.com and I can pick them up and publish them on this site. Billy was a real character. I remember in one game at Highbury not sure who the opponents were or who the referee was. He was challenged in his own penalty area and looked poleaxed as he lay on the pitch. The ball had now gone up the other end of the pitch before the referee stopped the match and came running back to Billy. As the ref got to about 3 yards to Billy up he jumped with a smile on his face and ran up the field. He rightly got booked but everyone around me was in stitches. Billy you are a funny man I shame no characters like you playing today.